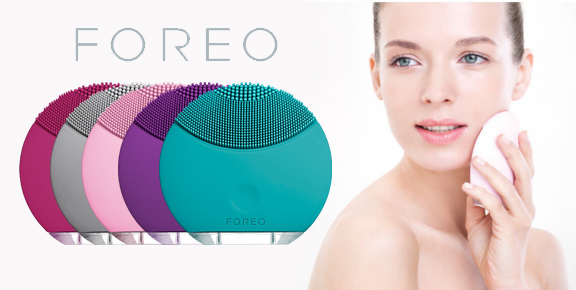 I've got to be honest...when I was first handed the Foreo LUNA Mini I was bewildered by it's appearance. I had no idea what it was for or what I was supposed to be doing with it. Now that I've been using it for two weeks, I'm hooked. Read on to find out why! The LUNA Mini is a ergonomic, deep-cleansing facial device that fits in the palm of your hand. This device deep cleans your face without being too harsh, so it's great for all skin types, including sensitive and acne-prone. Like the LUNA, this compact version offers T-Sonic technology, which stands for "transdermal sonic". The LUNA Mini delivers 8,000 pulsations per minute. Unlike standard oscillation, transdermal sonic pulsations gently stimulate blood flow beneath the skin’s surface, cleansing from the inside out and smoothing away the signs of aging. It's basically massaging your skin to a cleaner, healthier state! Since the LUNA devices are made of quick-drying, nonporous silicone that resists bacteria buildup, they are 35 times more hygienic than your standard bristled facial-cleansing brushes. The rounded silicone touch-points glide across the face, making it gentle enough for daily use and delivering nonabrasive, extra-gentle cleansing that feels amazing on the skin. Like, REALLY amazing! When I first started using this device, I admittedly did not read the complete instructions. You're actually only supposed to use the device for one minute. The device powers off after three minutes to prevent overuse... I just thought that my minute long facial cleanse took FOREVER! There is a built in timer that pauses the pulsations every fifteen seconds to indicate when you should move to another area of your face. When the minute is up, the pulsations will pause and the bottom of the device will flash three times in succession to signify the end of your cleansing routine. The LUNA Mini offers two intensity modes. If you press the center button once, you'll be in "high-intensity mode". If you press the center button twice, you'll be in "low-intensity mode". I've been using "high-intensity mode" because it feels like a facial massage to me, rather than a daily chore! 1. First things first, wet your face and apply your favorite cleanser. You can use any facial cleanser with the LUNA Mini, but to keep your device in optimal condition, avoid using clay-based, silicone-based or grainy cleansers as they may damage the silicone touch-points. It's also STRONGLY ADVISED that you DO NOT use cleansing oils with the LUNA devices because they will damage the silicone. 2. Wet the device and turn it on by pressing the center button. It's completely waterproof, including the charging point, so you don't have to worry about keeping water out of that hole. For the first week of use, I didn't know this and was super paranoid about breaking the device by getting water in it. I was cleansing with my finger over the charging point until I found this helpful hint out! 3. As soon as you've selected the desired intensity, gently move the LUNA Mini in circular motions over your face for one minute. When the minute is over, simply power off by pressing the center button again, and then rinse your face. 4. That's it, you're done. The LUNA Mini boasts that just one minute, twice a day, will visibly improve your complexion in three days. Blemish-causing impurities are gently cleansed away, which will not only improve the absorption of your other skincare products, but leave your skin looking clearer, healthier and glowing. I can personally agree with these statements. After the first use, I was already raving about it! My skin felt so soft and clean. Now that I've used it for two weeks, I can definitely say that my skin is feeling and looking much healthier. I've noticed less breakouts, practically no pore buildup, and yes...my skin is glowing! I recently visited my esthetician and she even commented on how great my skin was doing! Beautiful skin may come naturally to some, but for most, it takes care and commitment to get there. The LUNA Mini is definitely helping me get there! Have you ever used a LUNA device? How does your experience compare? We'd love to hear from you! If you have any questions or comments for us, please contact us at customerservice@beautystoredepot.com or give us a call at 1-800-926-5219.